Grace College men’s basketball coach Jim Kessler (center, red shirt in photo) is featured in in this week’s edition of The Paper, a weekly newspaper in Kosciusko County, Indiana. 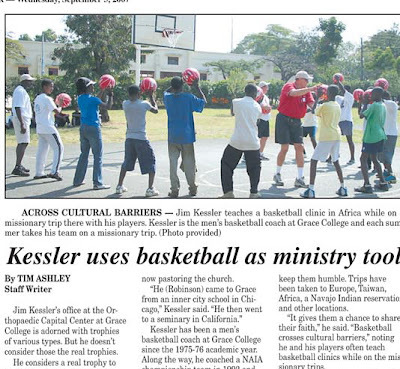 The article, titled “Kessler Uses Basketball as Ministry Tool,” emphasizes Coach K’s goal of leading his players to make a difference for Christ in the world. To read the article, which is on page 2 of the publication, go to http://www.the-papers.com/OnlinePubs/default.aspx?pub=TP&subpub=KOA&pubdate=09-05-07-09-11-07 (or paste this address into your browser).